Many coin collectors wonder when they should stop collecting one type of coin and try building different coins. The answer isn't always so simple. The decision to abandon collecting one set of coins for another happens on a case-by-case, individualized basis, but almost always happens when one of the following scenarios occurs. It happens almost every time with collectors who have relatively small coin collecting budgets. They have a coin folder full of Lincoln cents, Jefferson nickels, or perhaps even Mercury silver dimes. Almost every hole is filled – normally all the holes for the common coins. Then there are those holes for the more expensive coins, including the semi-key and key coins. There's nothing wrong with having open holes in a coin album or coin folder – it gives the collector a goal to aim for, and something to shoot for over the long term. But if filling those empty holes will be financially impossible (save for winning a lottery jackpot), then perhaps it's time to shift the focus to a more affordable coin series. We've all been there… You start collecting a series of coins you've had interest in for a while, and you went out to your nearest coin dealer and bought a fresh new folder or album and several of the coins necessary to help fill up that new holder. But weeks, months, or perhaps even years have passed, and that coin set sits idly in your vault or on your bookcase. Maybe you've even got the discretionary funds required to buy the rest of the coins to complete the album, but you just don't want to anymore. You've had enough of the set and would like to work on a new coin collecting goal. That's OK, because so many coin collectors have been in a similar spot. If the urge to finish a certain set has evaporated, maybe it's time to find a new objective. #3 – So Many Goals, Not Enough Budget! 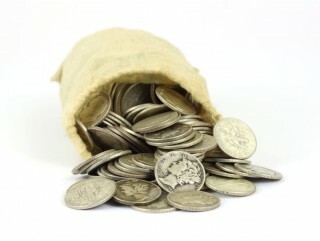 Countless coin collectors have about a dozen different types of coins they'd love to be collecting. Let's face it – there are so many neat coins to collect, but all too often not enough discretionary budget to collect them all. Sometimes, collectors have several partial sets on their way to completion, but with no hope of ever completing all of them because of a lack of funds. Maybe it's time to clean house and start all over again, focusing on one, maybe two or three, coin sets that afford you a reasonable chance of finishing the desired assemblage. #4 – Your Set's Complete – Time For a New One! You've finished building the coin set you've set out to build? Congratulations! So, what's next? It's time to move on to building another coin set… And, oh, there are so many different types of coins to choose from! Need help? Look at our gold and silver pages to find an exciting new coins set to start collecting today!